She calls me "Mama Leisha": Today Is Special! Since that day THIRTY-TWO piñatas have been delivered to friends and strangers alike! The majority of them have made their way to front porches and mailboxes all across the state of Utah. 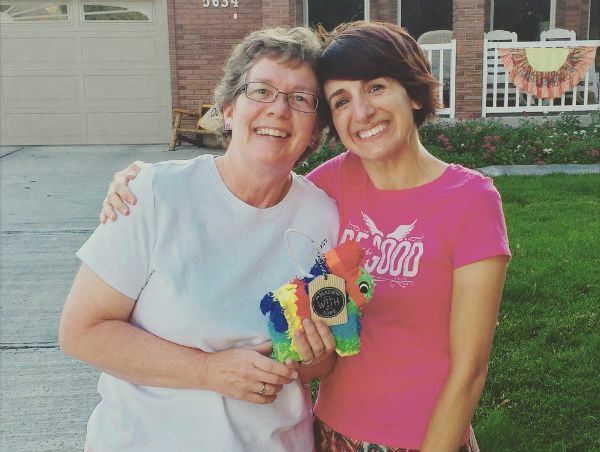 One piñata traveled as far as Kentucky; another found a home in South Carolina. Even my friend, Vinny, caught the "Piñata Fever" and left some piñata love on Dallas, Texas porches! Piñatas have been donated by small, local businesses as well as treasured friends who support me unwaveringly. I have given piñatas to people who have felt overwhelmed by life's challenges. I have given piñatas to people who have been sick, who have lost loved ones, who have felt alone or depressed. I have given piñatas to people as a unique and quirky way of expressing my gratitude for them. Even a couple of my fellow "Autism mamas" have been recipients of cupcake-shaped cardboard! And every night, as my weary head hits my beloved pillow, I whisper to God a simple prayer: Thank you, thank you, thank you for inspiring me to do this. I am blessed, I am blessed, I am blessed. So today I am celebrating! I am celebrating candy-filled donkeys and random acts of kindness! I am celebrating service and inspiration and goodness! (I might celebrate donuts, too. Which have nothing to do with my piñatas...I just really, really love them!) I think I'll celebrate by doing something nice for someone today. Do me a favor? Celebrate with me? Be kind, give service. Olé! What a great idea for service! I don't know how long making a pinata might take for you, but for me....days!